It's official: With the addition of a new web browser version, there is simply no escape from Angry Birds. This latest iteration of the wildly popular avian-launching game was unveiled this morning at Google's ongoing I/O event. 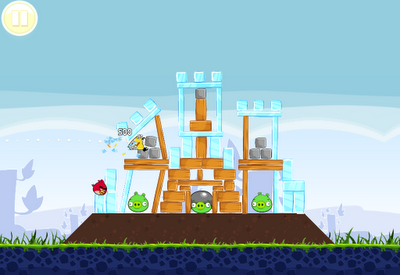 The search engine giant recently added an Apple-style app store for its Chrome web browser, and Angry Birds seems to be something of a flagship game for the service. As a result, the announcement also touted certain features within the game exclusive to the Chrome browser. Though Angry Birds should eventually run in any browser -- it's built on the open WebGL platform -- the Chrome version includes exclusive levels, "Chrome bombs" and other special additions that you can only find in the game's Google-branded browser incarnation. Fortunately for impatient fans, there's no wait for the latest version of Angry Birds. The title is already available on the Chrome store, for the low, low price of "free." Chrome fans are likely giddy, but what about the rest of you? Is this enough to make you abandon Firefox, Safari, Opera or Internet Explorer? Has Google really just dominated another segment of the 'net with the help of a glorified Flash game? Is anyone else hoping this signals an inevitable DOOM port?